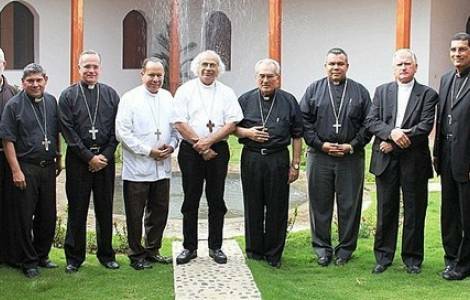 Bishops of Nicaragua denounce "the harsh repression against peaceful citizens"
The Archbishop of Granada: "Among tensions and violence, the baptized live the message of Christ’s love with profound faith"
Managua (Agenzia Fides) - "Witnesses, companions and advisers" will take part in the national dialogue in Nicaragua. The agreement reached in the last two days therefore provides that in addition to the two parties (Government and Civic Alliance), other persons falling into these three categories will be present at the dialogue table. This was announced yesterday evening, March 5, by Carlos Tünnermann, representative of Civic Alliance, speaking to the local press. The figure of the guarantors is still under discussion. In the interview with the Nicaraguan press, the Civic Alliance representative also informed that a written invitation was delivered to the Episcopal Conference (CEN), signed and delivered by the representatives of the two parties. Agenzia Fides received confirmation of this invitation from the Bishop of Estelí, Mgr. Abelardo Mata, who reported in a message that CEN received the official invitation last night, but also stressed that the Bishops do not want to be used for political tactics or underground agreements. Carlos Tünnermann recalled in yesterday's press conference that "for Civic Alliance the presence of CEN is of vital importance in the process of national dialogue. In the current context for Nicaragua, CEN is the most credible institution and therefore the Bishops must be present as witnesses".